In the Christian art Buon Fresco has become a favorite way to decorate the walls of the stone temple. Artists of various epochs treated for this technique thanks to its proven durability, unique velvety of the surface and nobility of the colours. In Europe in the era of Renaissance art wall painting has become one of the most important criterion of craftsmanship of the artist. In Italy the fresco painting reached its highest development. Nowadays, in the era of oversaturated visual information, the painting of the walls of the temple takes on particular importance. The traditional technique in combination with the modern thinking allow you to create a memorable emotional atmosphere. 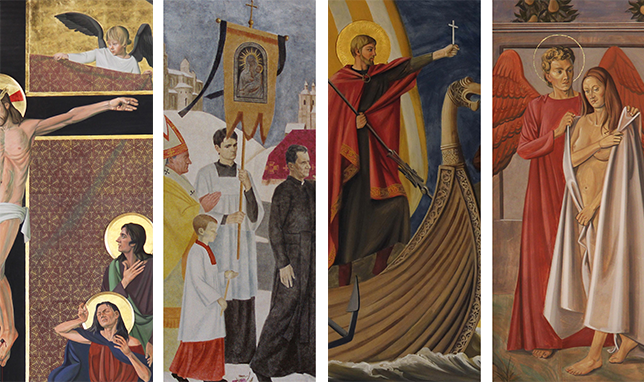 We are convinced that high quality frescoes have a positive impact on the spiritual and cultural life of a person.